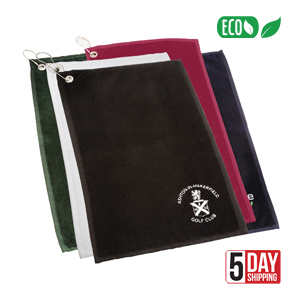 Top quality 100% cotton, 420 grams velour golf towel embroidered or printed to your design, with a silver eyelet and a silver clip for attachment to golf bag. Closest pantones : Navy Blue 2767, Royal Blue 2945, Burgundy 188, Dark Green 357. As a guide only - not exact. Certification available showing AZO Free dyes used. Dimensions : 500mm x 300mm. Print Area : 250mm x 100mm.